This guide is intended to provide a comprehensive description of the encounter with Hellfire Assault in Hellfire Citadel. It is targeted at anyone who desires to understand the fight mechanics. 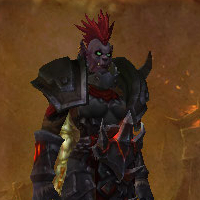 Hellfire Assault is the first encounter in the Hellfire Citadel raid instance. The encounter tests your raid's ability to handle numerous types of adds while performing a series of straightforward tasks, and as with most introductory encounters, it is aimed at evaluating your raid's worthiness for the instance. The Hellfire Assault is a single-phase encounter where add-control plays a central part in your raid's success. In order to defeat the encounter, the raid must protect two Hellfire Cannons that continuously attack a large door at the end of the room, until that door is destroyed. The cannons operate automatically, but must be supplied with ammunition throughout the fight. The encounter itself consists of your raid dealing with a number of different adds, and a mini-boss called Siegemaster Mar'tak. Some of those adds will attack your Hellfire Cannons. If both cannons are destroyed, the encounter is failed. If only one cannon is destroyed, the raid can still theoretically succeed, but the encounter will take twice as long to finish. On the PTR, when a Hellfire Cannon was destroyed, this triggered an ability called Hellfire Destruction, which killed all raid members. This ability has since been removed from the Dungeon Journal, so we are not sure if it will be present on live servers or not. Perform a tank switch when the Hulking Berserkers' Slam debuff stacks to uncomfortable levels. On Mythic mode, perform a tank switch on Grute, when the Slam debuff he applies stacks too much. Dispel Conducted Shock Pulse, a debuff applied to 1-4 members and cast by Contracted Engineers. Beware of the high raid damage inflicted by Felfire Volley after Gorebound Felcasters turn into Terrors. On Mythic mode, before of the high damage the aid may take while Grand Corruptor U'rogg and Grute are alive. Also heal the healing absorption shields applied to players targeted by Corruption Siphon. Interrupt Incinerate and Felfire Volley, cast by Gorebound Felcasters/Terrors, and Repair, cast by Contracted Engineers. Avoid various ground-based abilities: Shockwave, Boom bombs, Siege Nova, and Belch Flame. Avoid standing in front of Felfire Crushers, and be aware of the fire they spew with Burn. When the Felfire Artillery casts Artillery Blast, stand at least 40 yards away from the Hellfire Cannons. When Mar'tak casts Howling Axe, stand at least 8 yards away from everyone else. Pick up and carry Felfire Munitions, dropped on death by the various Siege Vehicles, to the Hellfire Cannons in order to restore their ammunition via your extra action button. On Mythic Mode, also avoid the Cannonball and Corruption Nova ground effects. A few words about the environment in which the fight takes place are in order. The goal of the encounter is for your raid to destroy the Reinforced Hellfire Door, located at the end of the room. However, this door cannot be damaged by raid members through normal means. The door can only be damaged and destroyed by the two Hellfire Cannons located in the room. The Hellfire Cannons are located on the left and right side of the encounter area, respectively. They operate automatically with no need for specific player input. The cannons continuously attack the Reinforced Hellfire Door, using a special resource called Felfire Munitions. These munitions are a limited resource, which the cannons will run out of eventually. As we will see later in the guide, your raid can replenish this resource. The Hellfire Cannons can be damaged by the Felfire-Imbued Siege Vehicles (adds that spawn throughout the encounter), and if both Hellfire Cannons are killed, then your raid has no other way to complete the encounter. If one Hellfire Cannon is killed, the Reinforced Hellfire Door will take much longer to kill, but success is still theoretically possible. As stated earlier, on the PTR, when a Hellfire Cannon was destroyed, the raid was instantly killed by Hellfire Destruction, but we are not sure if this ability will be included in the live version of the fight. Throughout the fight, your raid will have to contend with a mini-boss called Siegemaster Mar'tak, with several types of Siege Vehicles that attempt to destroy the Hellfire Cannons, and with a relatively large number of adds. In the following subsections we will look at all the abilities used by these mobs. Howling Axe is an ability that Siegemaster Mar'tak regularly uses throughout the fight. Mar'tak debuffs several raid members with Howling Axe. When the debuff expires, the affected raid members take a high amount of Physical damage, and deal the same amount of damage to any players standing within 8 yards of them. Shockwave is a frontal cone attack that Siegemaster Mar'tak regularly uses throughout the fight. Shockwave deals high Nature damage to all affected targets, knocking them back. The area where Shockwave is about to be cast is indicated a few seconds in advance by a visual effect on the ground. Inspiring Presence is an aura that Mar'tak applies to all adds, causing them to deal 10% increased damage. The power of this aura increases over time, and it fades from all adds as soon as Mar'tak is defeated. Despite the wording of the tooltip, this buff affects all adds in the fight, regardless of their proximity to Mar'tak. Siegemaster Mar'tak leaves the fight when she reaches 50% health, so the raid does not have to kill her. Adds regularly spawn throughout the encounter, from portals that appear roughly every 45 seconds. We do not know the exact spawn interval of these portals, yet. It is very possible that they increase in frequency as the fight goes on. Gorebound Felcasters are ranged adds that can be tanked. Usually, two Felcasters will spawn from each portal. Incinerate is cast by Gorebound Felcasters almost constantly. It is an interruptible spell that deals high Fire damage to the Felcaster's current tank. Felfire Volley is regularly cast by Gorebound Felcasters. It is an interruptible spell that deals high Fire damage to all raid members. Metamorphosis is cast by Gorebound Felcasters when they have been alive for some time. When Metamorphosis is cast, the Felcaster permanently becomes a Gorebound Terror, increasing its damage done by 30%, movement speed by 70%, and granting it immunity to crowd control. Contracted Engineers are melee adds that can be tanked. Usually, two Engineers will spawn from each portal. Repair is an interruptible channeled spell with a 1.5-second cast time, regularly used by the Contracted Engineers if a Siege Vehicle (an important type of add discussed in the next section) is currently active. It heals the targeted Siege Vehicle for 3% of its total health every half-second for the duration of the channel. Conducted Shock Pulse is occasionally cast by Contracted Engineers. It is a debuff that affects up to 4 random raid members and deals moderate Nature damage upon application, as well as stunning them for 6 seconds. The number of targeted players appears to be random. Boom is an ability that the Contracted Engineers regularly use. It places a bomb at the feet of a random raid member, dealing moderate Fire damage to all raid members in a small radius around it after a short period of time. Hulking Berserkers are melee adds that can be tanked. Only one Hulking Berserker spawns from every portal. Slam is an ability that Hulking Berserkers regularly use. This deals moderate Physical damage to their tank and applies a debuff called Slam to them. Slam is a stacking debuff that increases the target's Physical damage taken by 30% for 15 seconds. This ability requires a tank switch. Cower! is an ability that Hulking Berserkers will occasionally use. It affects all nearby raid members with Cower!, reducing their movement speed by 20% and inflicting moderate Physical damage that bypasses armour. Iron Dragoons are melee adds that can be tanked. They simply use melee attacks against their tank. They have no other abilities and they have a modest health pool. Throughout the fight, various Siege Vehicles occasionally spawn (one roughly every minute) and attack both your raid as well as the Hellfire Cannons. As soon as they spawn, the Siege Vehicles immediately move towards the Hellfire Cannons to damage them. There are several different types of Siege Vehicles, each with their own unique abilities. The Siege Vehicles mostly use melee abilities, but some of them also have a ranged ability. Felfire-Imbued Siege Vehicles can not be tanked or crowd controlled. Whenever a Siege Vehicle of any type is destroyed, it drops Felfire Munitions. Raid members can pick these munitions up by right-clicking them, and they can use them to reload the Hellfire Cannons (via an extra action button). When picking up the Felfire Munitions, raid members gain a 100% movement speed increase for 9 seconds, and they also take moderate Fire damage every second for as long as they are carrying the munitions. Felfire Crushers are the only Siege Vehicles that have no ranged abilities. Therefore, the Crushers have to move all the way to the Hellfire Cannons' melee range to be able to damage them, meaning that they have to travel the longest distance among the different types of Siege Vehicles. That said, they can still damage raid members on their way to the Cannons. Crush is a frontal cone attack that the Felfire Crusher regularly uses, regardless of whether or not there any targets in front of it. This deals heavy Nature damage to all raid members hit by it, and it also damages Hellfire Cannons. Bore is an ability that the Felfire Crusher constantly uses. It deals heavy Nature damage to all targets in front of it every 0.5 seconds. Burn is an ability that the Felfire Crusher regularly uses. Burn causes flames to spew from the Felfire Crusher in random directions for 4 seconds. Players who come in contact with the flames take moderate Fire damage every 0.5 seconds. Belch Flame is a ranged attack that the Felfire Flamebelcher casts when it gets close to a Hellfire Cannon. It causes a volley of flames to land in a small radius around the Flamebelcher, dealing heavy Fire damage to any raid members located in the affected area. Belch Flame also damages Hellfire Cannons. Artillery Blast is an ability that the Felfire Artillery regularly uses, inflicting moderate Fire damage to the Hellfire Cannons, and anyone standing within 40 yards of them. Siege Nova is an ability that the Felfire Demolisher occasionally uses. This targets a large area on the ground with green fire, and soon after that mortars land in that location, dealing moderate Fire damage to anyone hit by them. Afterwards, another location is marked and the Demolisher fires a final mortar blast, which damages the entire raid for heavy Fire damage. This damage decreases the further away players stand from the impact location. Your raid has to combine several different elements in order to successfully defeat the Hellfire Assault encounter. We will summarise them in this section, and we explain them in detail in the following subsections. Your DPS will have to forego unnecessary AoE/Cleave in order to ensure that important targets die as quickly as possible. At the start of the fight, this is Siegemaster Mar'tak, and later on mostly the various Siege Vehicles, and the Gorebound Felcasters/Gorebound Terrors. We cannot overstate the importance of killing Siege Vehicles as quickly as possible. An assigned raid member, usually a very mobile, ranged player will have to pick up Felfire Munitions and bring them to the Hellfire Cannon with the lowest ammunition remaining. High DPS must be focused on the Siege Vehicles before they deal too much damage to the Hellfire Cannons, destroying them and essentially wiping your raid. Several abilities have to be interrupted throughout the fight (most importantly Felfire Volley and Repair). All raid members will have to avoid taking damage from the various avoidable abilities used throughout the fight. When faced with multiple targets in this fight, we recommend that you generally stick to this priority for killing them. The adds are mostly ordered by how detrimental they are to your raid's success. As we mentioned before, the Siege Vehicles in this fight cannot be tanked. This leaves the Gorebound Felcasters/Gorebound Terrors, Iron Dragoons, Contracted Engineers, Hulking Berserkers, and Siegemaster Mar'tak to be picked up and handled by the tanks. While Siegemaster Mar'tak is up, she should be tanked on top of any other adds that are alive, in order to maximise the damage your raid can do to her. This is because Mar'tak must be forced to leave the fight (we remind you that she is defeated at 50% health) as soon as possible, so as to prevent her Inspiring Presence becoming too powerful. A tank switch must frequently be performed to deal with the Slam debuff that the Hulking Berserks apply. When this happens, the tank who was tanking Mar'tak should take the Berserker(s), as well any other adds currently alive. Given the limitation on the number of adds that can be taunted, some adds may linger on the other tank. Since most adds, aside from the Hulking Berserkers, die quite quickly, this should not really be a problem. Currently, we do not know exactly how many stacks to recommend switching at. When raid members are targeted by Howling Axe, they must move 8 yards from everyone else, and from each other to minimise the damage taken from this ability. Shockwave must be avoided. Since it is a cone attack, it is generally advised that you stay relatively close to the boss. This will make it easier to dodge the Shockwave, and minimise the amount of movement needed to do so. As soon as the fight starts, the raid should focus all DPS on Mar'tak in an effort to bring her to 50% health (and thus remove her from the fight) as quickly as possible. Incinerate must be interrupted as often as possible. Since it is constantly being cast, preventing all of the casts is impossible, but you should still do your best. Felfire Volley must be interrupted. It happens rather infrequently, so attentive raid members must make sure to interrupt it when it is being cast. If you have limited interrupts available, you should prioritise interrupting this over Incinerate. When the Felcasters cast Metamorphosis, they simply become more dangerous. Since most raid members will be already targeting the Felcasters, nothing special is advised when the Felcasters become Terrors. When the Contracted Engineers channel Repair on a Felfire-Imbued Siege Vehicle, their cast must be interrupted as quickly as possible. Every half-second, the targeted Siege Engine will be healed for 3% of its health, and this can mean the difference between the Siege Vehicle being able to cast an additional spell or not. Conducted Shock Pulse must be dispelled as quickly as possible from all raid members affected by it. Raid members targeted by Boom must move 5 yards away from the bomb placed at their feet to avoid taking damage. Nothing can be done to mitigate Cower!, which will just inconvenience your raid and which must be healed through. Likewise, the Iron Dragoons have no abilities and require no special handling whatsoever. They should simply be tanked and cleaved down to keep their numbers in check. Siege Vehicles are a very high priority throughout the fight, since keeping the Hellfire Cannons alive is of paramount importance. That said, given the fact that they spawn much less frequently than the other adds, we chose to discuss them last. Bore means that nobody must stand in front of the Felfire Crusher at any point, as this can very easily kill them. When the Felfire Crusher spews fire out of its sides using Burn, raid members must move away from these areas to minimise damage taken from it. Given its random pattern, it is not feasible to avoid Burn entirely, but care must be taken not to take more damage than necessary, as with most other abilities. The Felfire Crusher will regularly use Crush even when it has not reached one of the Hellfire Cannons. Nothing can be done about Crush except preventing the Felfire Crusher from casting it more than necessary, by destroying it as quickly as possible. When the Felfire Flamebelcher casts Belch Flame towards a Hellfire Cannon, raid members must quickly move far out of the ground effect that marks where it will hit seconds afterward. Nothing else can be done about Belch Flame except preventing the Felfire Flamebelcher from casting it more than necessary, by destroying it as quickly as possible. When the Felfire Artillery casts Artillery Blast, raid members must move at least 40 yards away from the Hellfire Cannons to avoid taking the heavy damage that the Hellfire Cannons will take. Nothing else can be done about Artillery Blast except preventing the Felfire Artillery from casting it more than necessary, by destroying it as quickly as possible. When the Felfire Demolisher casts Siege Nova, players must move away from each impact location, and move as far away as possible from the final, bigger impact in order to take as little damage as possible. DPS players should use their Legendary Ring whenever a new Siege Vehicle appears. Given that they spawn very frequently, this will be mostly on cooldown.On Mythic mode, a usage should be saved for both Grand Corruptor U'rogg and Grute. Healers should likewise use their Legendary Rings as often as possible, and on Mythic mode they should also save uses for each of the two mini-bosses. Tanks should use their Legendary Ring whenever the Slam debuff applied by Hulking Berserkers stacks up high. On Mythic mode, a usage should be saved for when Grute spawns. The Hellfire Assault is a DPS-focused add-control encounter where your DPS players will have to cleverly save cooldowns for when very important targets like the Felfire-Imbued Siege Vehicles spawn, while still making sure that everything else dies in a timely fashion. Depending on what adds are active, the entire raid will have to dodge a number of avoidable abilities, all the while keeping the Hellfire Cannons supplied with Felfire Ammunition. interrupting Gorebound Felcasters'/Gorebound Terrors' casts of spells that deal damage to your tank and raid, and interrupting the Repair cast by Contracted Engineers in order to finish off the Siege Vehicles as quickly as possible. The Mythic mode of the Hellfire Assault encounter is relatively similar to the Normal/Heroic version of the fight, but there are a few, notable changes that will drastically impact the way that this fight is dealt with. Aside from everything dealing more damage and having more health, the Mythic version of this encounter presents the raid with a new sort of Siege Vehicle, Felfire Transporter, as well as with two new mini bosses. Finally, there are several changes in the way some of the Normal/Heroic mechanics work. Throughout the fight, three Felfire Transporter Siege Vehicles will spawn. These enter the fight at predetermined moments (the first comes in around 3 minutes into the fights, and the other two around 6 minutes and 7 minutes and 40 seconds into the fight, respectively). Like the other Siege Vehicles, the Felfire Transporters can be killed. They cannot be tanked, and while they are alive, they will often use Call to Arms!, summoning a number of Iron Dragoons each time. In addition to this, the first Felfire Transporter that enters the fight will also bring with it a mini boss called Grand Corruptor U'rogg, which we explain below. As mentioned, the first Felfire Transporter will bring with it Grand Corruptor U'rogg, a mob your raid also faces in the trash leading up to the encounter. U'rogg uses 3 abilities against your raid. Corruption Bolt is an attack that U'rogg regularly uses against his current tank. It deals moderate Shadow damage in a single, 1.5-second cast. Corruption Nova is an ability that U'rogg occasionally uses. It marks a number of areas on the ground, and after a few seconds, anyone standing within two yards of these areas takes heavy Shadow damage. Corruption Siphon is an ability that U'rogg occasionally uses on two random raid members. It deals about 90% of their health in damage, and heals Grand U'rogg for 3 times this amount. Additionally, the targeted raid members gain a healing absorption shield for the damage that they initially took. Roughly 4 minutes after the start of the fight, another mini boss, called Grute, enters the fight. He uses the following abilities against your raid. Shockwave is an ability that Grute occasionally uses. It is the same as Siegemaster Mar'tak's Shockwave ability. Cannonball is an ability that Grute uses on a random raid member. He marks the ground beneath their feet and leaps to them after a few seconds. He will always leap at the current location of the raid member, meaning that the target player cannot avoid him. When he lands, Grute deals moderate Physical damage in a small radius. Slam is an ability that Grute regularly uses on his current tank. This is the same Slam ability used by the Hulking Berserkers. On Mythic difficulty, two Siege Vehicles will always roughly at the same time, one on each side of the room (each heading for one of the two Hellfire Cannons). The only exception to this rule is the period between 3 and 5 minutes into the fight (when the two mini-bosses enter), during which time very few Siege Vehicles will spawn. Finally, Siege Vehicles as a whole spawn much more frequently throughout the Mythic mode. The greatest difficulty in the Mythic mode of Hellfire Assault is dealing with the increased spawn rate of the Siege Vehicles. They do a lot of damage to Hellfire Cannons on Mythic mode, and it must be stressed that they are a very high priority for DPS to kill. We will get into the specifics of abilities further below, but we wish to outline the general strategy for Mythic first, in order to set the best precedent for dealing with the abilities, old as well as new ones. Split the raid into two equally sized groups, one to defend the right Hellfire Cannon, and another for the left one. When the Felfire Transporter spawns after roughly 3 minutes, the raid should meet in the middle and deal with Grand Corruptor U'rogg together. The same goes for Grute, who spawns roughly a minute later. As far as handling abilities is concerned, this is somewhat straightforward, if difficult. Grand Corruptor U'rogg's Corruption Bolt must be healed through. When he casts Corruption Nova, raid members must move out of the ground effects to avoid taking damage. Finally, for Corruption Siphon, healers must prioritise outhealing the absorb shields placed on the two targeted raid members. Tanks will have to perform a tank switch on Grute when the stacks of Slam reach uncomfortable levels. When Grute uses Cannonball, have the targeted raid member use a defensive cooldown, and move out of range of other raid members so that only they are hit. Finally, for Shockwave, move out of the cone ground effect, exactly as with Siegemaster Mar'tak's version of the ability. In this section, you will find the loot table for Hellfire Assault. The section is divided in 3 subsections: armor, weapons, and the rest (neck, back, finger, and trinket items). This concludes our raid guide for Hellfire Assault. We hope you have found it helpful. Please do not hesitate to post any feedback you may have on our forums. 30 Jun. 2015: Added Mythic mode strategy. 28 Jun. 2015: Added link to our LFR guide. 24 Jun. 2015: Clarified that Mar'tak's Inspiring Presence has unlimited range, and move her up to the top of the kill priority.